We’re excited to announce a new class coming to our schedule in February! 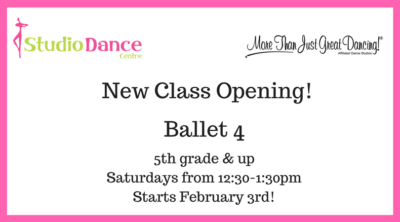 Due to popular demand, we’re opening a new Ballet 4 class for students in 5th grade or higher. The class will begin Saturday, February 3 and take place from 12:30-1:30pm. Interested? Just click right here and send us an email, and we’ll get your dancer signed up!